June 7, 2010 · Filed under Random Thoughts	· Tagged birthday, peonies, peony "Do Tell"
Wow, it’s my birthday. I will not tell you how old I am, except to tell you it ends in a zero. Actually, it was my birthday yesterday, but I do not post on the weekend, so I had to wait unil today. The best part about being born on 06/06, is you never have to remember if it is month or day first when filling out forms, love that! I am also wondering if my parents picked a “D” name, as it is D-Day, I guess I will have to ask, inquiring minds want to know! 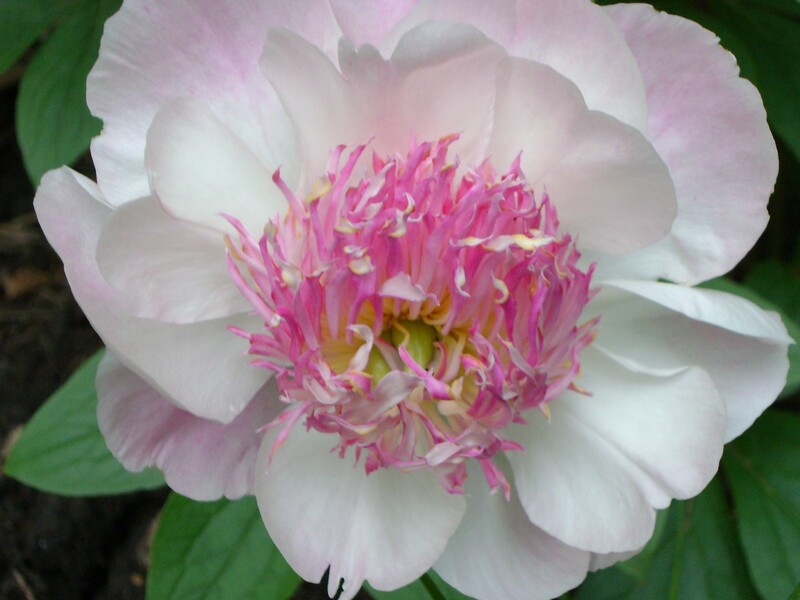 When I was a little girl, my Nana (the first garden influence I had) always used to put the first peony blossom on my birthday present. This has led me to a life long love for them (Pavlov’s Theory has nothing on this). I thought that I would share a picture with you of one of the gorgeous peonies currently blooming in my garden. Hope all your birthdays will be as fabulous as mine was, Do Tell! Does this look a bit like the Times Square New Years. Just waiting for the ball (or star) to drop. I hope that you all had a lovely Christmas and will have a Happy and Healthy New Years, (and get slightly polluted). I thought that I would take some time and list what I have accomplished this year. Sometimes, all you see is what you have to accomplish, not what you have accomplished. It took a regular reader, thank you BarbaraH, to point out how much my hedges have grown since I first planted them, all I could see, is how much more they need to grow, before they hide the Deliverance house. 1. I planted (finally) the lindens that I want to pleach (wish me luck on this) in the Lime Walk. 2. Two yew hedges were planted to create another garden room, I have no plans for this at the moment, but I am referring to it as the Yew Garden, so Ian knows what I am talking about. 3. The Serviceberry Allee was started. 4. The line of Emerald cedars on the north side of what will be my path leading from the driveway to the front door, has been planted. 5. The Peony Walk (all I seem to have is walks, couldn’t I come up with another name?) has been started. The peonies on the north side have been planted. 6. 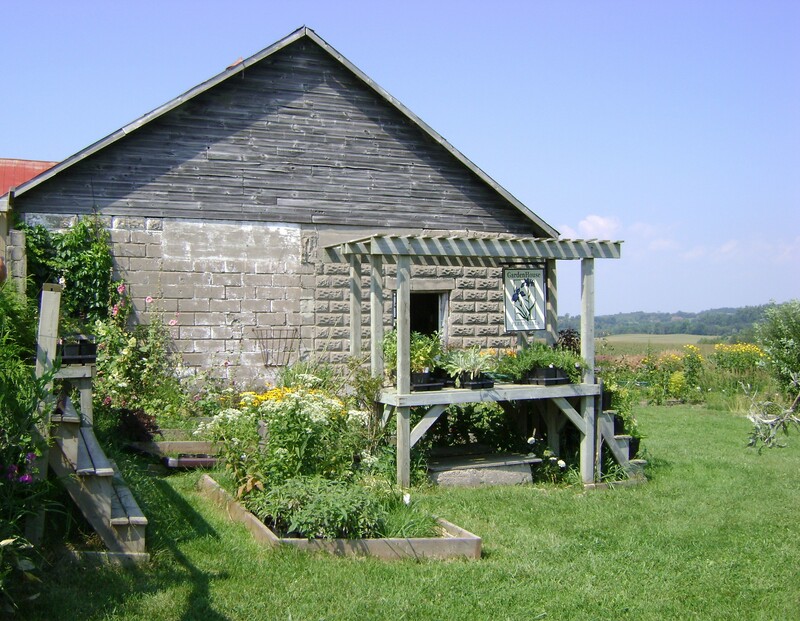 A new bed was built on the west side of the Kitchen Garden for Teza. 7. The stone stairs up to the cedar berm. When I look at this list, I do feel proud off all that Ian and I have accomplished. It is just a weekend home (and not every weekend). We do have to take some time and smell the flowers as well as plant them. When I was in Kingston my friend took me to a couple of good garden centres. She felt sorry for me, because I am always complaining that there is not as many of them in Owen Sound. The first one was GardenNet. 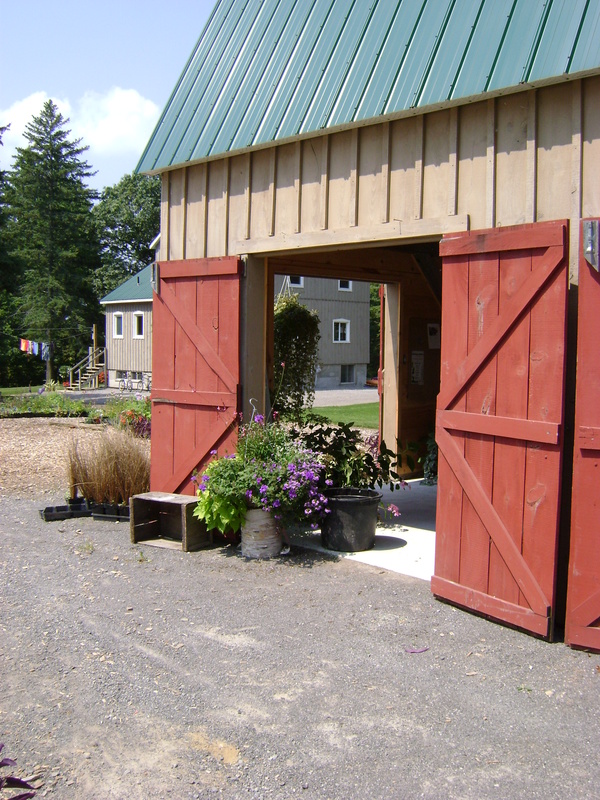 They are north of Trenton, and have a beautiful setting. 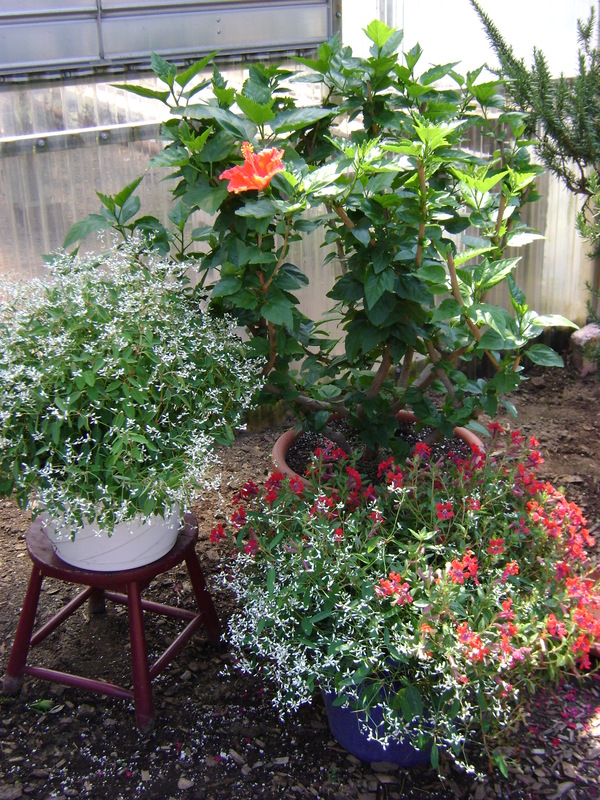 Based at the owners house, there is display gardens all around the house and nursery area. You walk into the display garden through a cedar arch. I took a picture to make sure that my husband gets a look. Tools are always at the ready! She has an amazing sense of colour and plants a lot of containers. Look how the colours in the container pick up the paint colour on the window trim and door. 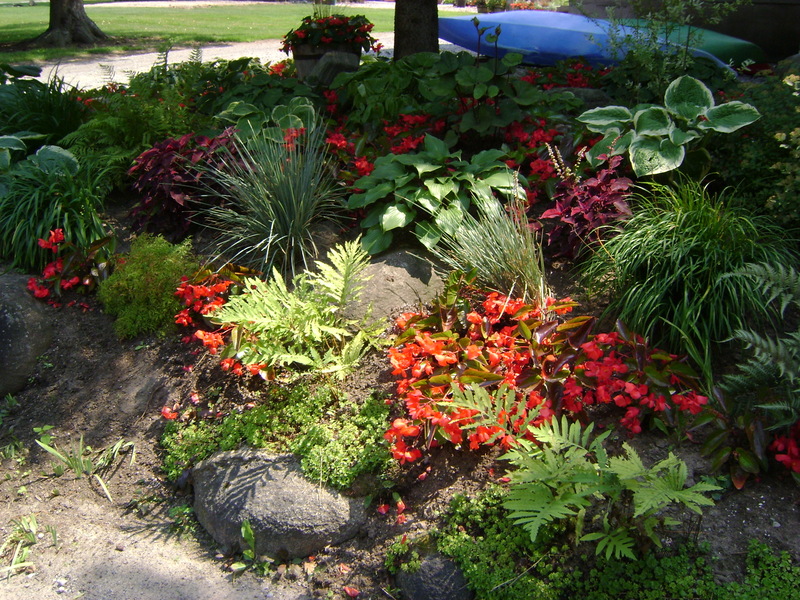 Part of her display garden near the road. Who says they don’t like red? 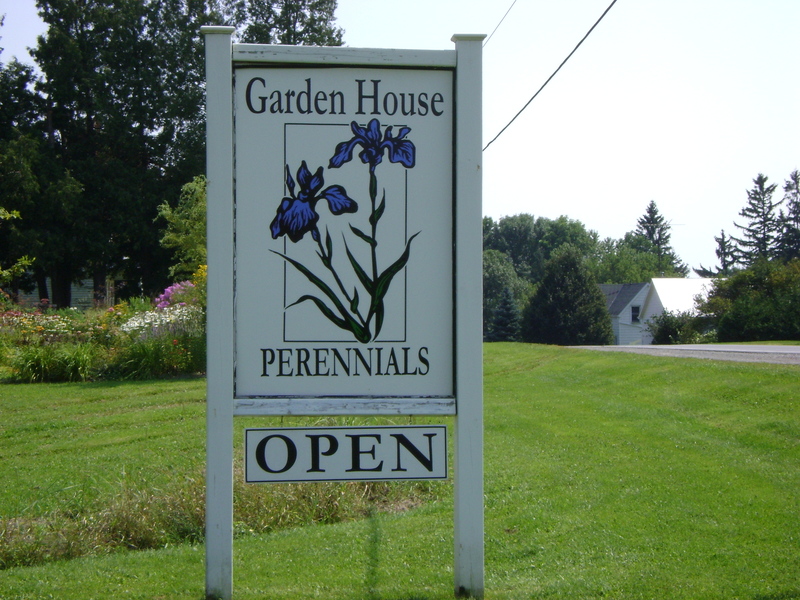 GardenHouse Perennials is another great nursery. They used to be based in Coburg, but moved up to Morganston. The building was an old cheese factory that they renovated and turned into a shop. 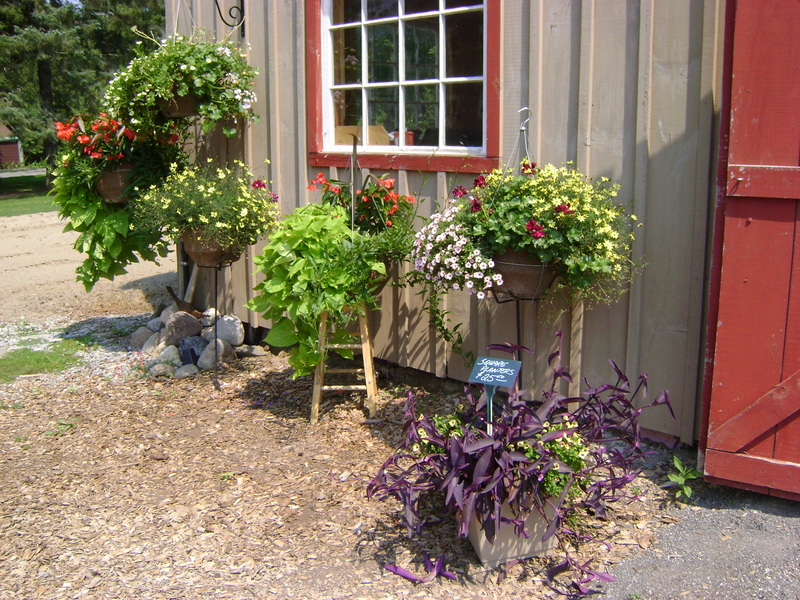 The outside has a huge display garden that the owner built in one summer, just him and his trusty dog. As well as selling plants from the shop they have a mail order business for daylilies and peonies. 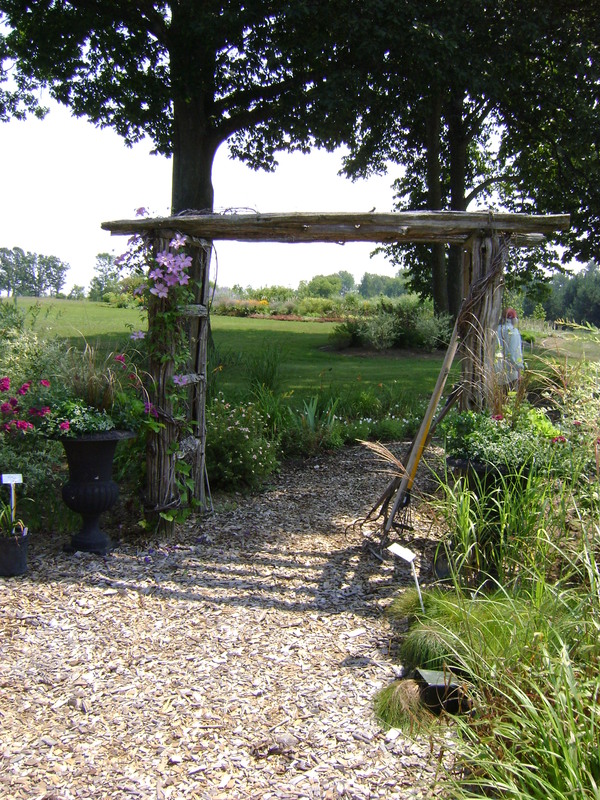 They also have a garden design and consultation business. This is an arrangement I made at work the other day. Florists love peony season, they are huge (the flower, not the florist-mostly!) and will give you a good focal point in an arrangement for a fairly inexpensive price. We are always looking for more bang for the buck! 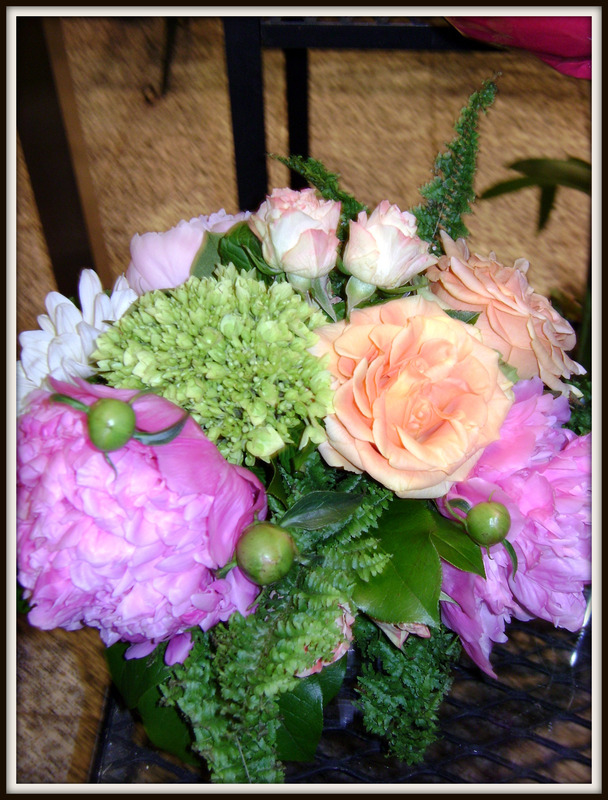 This arrangement was made in a clear glass cylinder vase and includes peonies, green hydrangeas, roses and dahlias. I needed some extra greenery so I cut a few fronds from a fern. The style of the shop where I work is very low and lush, we do mostly corporate work, so they must fit easily on a desk. With a low vase, you have less chance of tipping the vase and ruining your keyboard. And that’s a good thing! When you buy a plant on sale at the end of the season, you have no idea whether or not it is incorrectly tagged. This peony was marked “Do Tell” but it was long out of flower and I was taking a big chance. Had someone moved the tag from another peony. I love all peonies, but I didn’t want to pay that much(even on sale) if it wasn’t the original. Luckily, it wasn’t incorrectly named. I have had that problem in the past. You work out a careful colour scheme, all white and black flowers and the tulips that you bought had a couple of red in amongst them. Or worse, you spend a ton of money on a magnolia and wait a few years for it to flower only to find out that it is “Leonard Messel” not “Merrill”. This wouldn’t happen to me if I wasn’t so cheap. I blame my Scottish mother. I could pay full price and get them when they are in flower, making sure that they are the right colour. And I know that I could have spoken/or returned the magnolia to the nursery and they probably would have done something about the mislabelling (of course, only if I had bought at full retail, when it is on sale it is buyer beware). But then I would have less plants in my garden. And sometimes it is a happy accident. But I am still relieved that Do Tell is actually Do Tell!